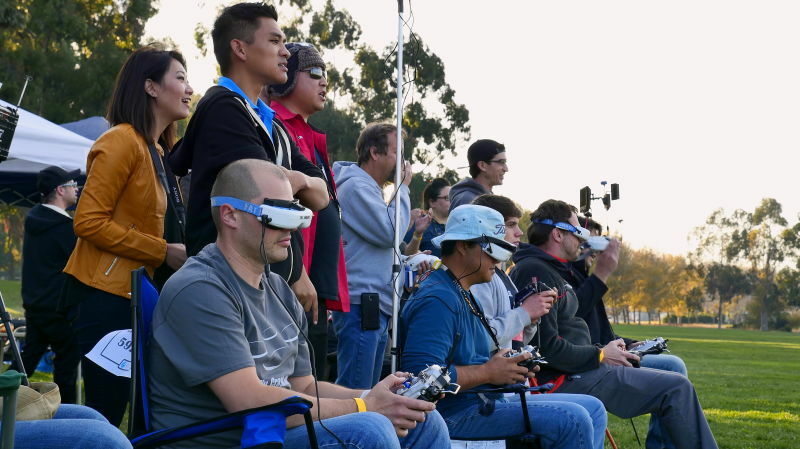 Nearly 50 drone racing pilots flocked to a sports field in the heart of Silicon Valley last month to compete in a day of races and drone to drone combat. The day was organized by Ken Loo, an avid drone racer and the president of the South Bay chapter of the Aerial Sports League. "The Aerial Sports League is a group of hackers, makers and do-it-yourselfers that got together and wanted to promote the sport of drone racing, freestyle and drone combat," said Loo, who by day works as a product design engineer for a tech company in Silicon Valley. Loo showed up at Baylands Park in Sunnyvale just before dawn to set up the racing course. Throughout the day, he juggled organizing duties while also finding time to compete in the freestyle event and the qualifying race heats which culminated in the championship race between the top five drone pilots. But the drones used for racing are not the ones you'll find for sale at Best Buy, Fry's Electronics or Amazon. 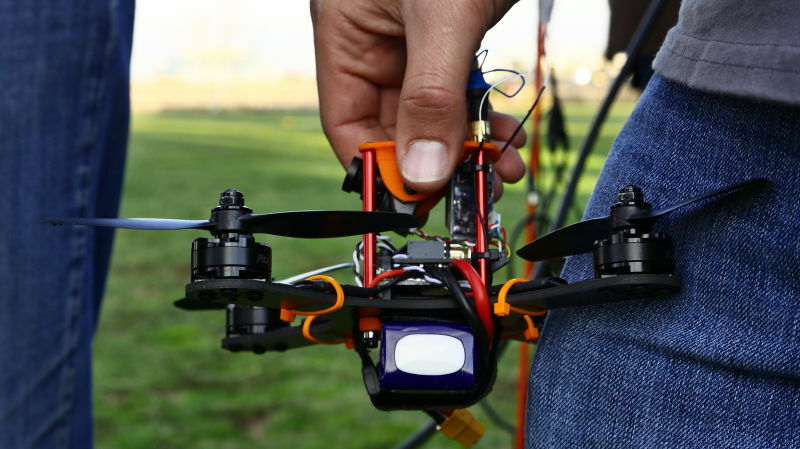 Racing drones are typically under a pound in weight, including the battery, and are built by hand for speed - not selfies - using parts such as carbon fiber frames, tiny motors, propellers, flight controllers and other components that are purchased online or at hobby shops. In 2014, Loo started racing drones that he built by hand, a process which now takes him three to four hours to make a drone that can rocket through the air at 80 miles per hour. "What I really love about flying drones is the feeling of flying," Loo said. "I feel like I'm in the cockpit of an aircraft." 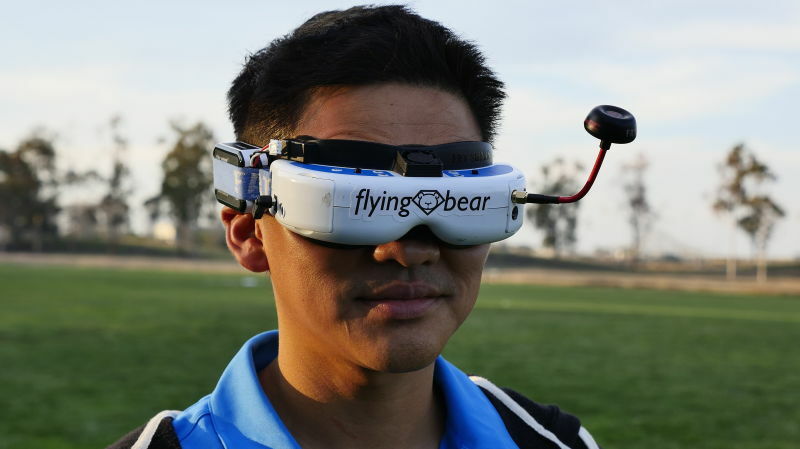 Drone racing pilots wear First Person View goggles equipped with an antenna that picks up an analog video feed from a camera mounted on the drone to deliver the real-time sensation of flying furiously past objects, somersaulting in the sky or taking a plunge from 100 feet in the air onto a grassy field below. Loo considers drone racing to be a sport, not just a hobby, and he practices several days a week during his lunch hour with five or six friends who set up flags, tunnels, gates and other obstacles they steer their drones around, including the occasional soccer player who runs onto their race track to collect a stray ball. The engineer turned drone advocate concedes that the geeky nature of the sport attracts mostly young males with tech or engineering backgrounds. "A lot of the people that are doing this and building their own drones and tinkering are (from) the engineering community, which is also heavily male-dominated," Loo said. Zoe Stumbaugh, a Santa Cruz resident, is one of the few female drone racing pilots who competes nationally. Using a drone with inverted thrusts that allowed her to fly upside down while doing tricks in the air, she was one of the pilots who competed in the freestyle portion of the Aerial Sports League tournament in November. "Drone racing is definitely a male-dominated sport," she said. "I'm hoping that by being in the forefront and kind of leading the way, others will follow and we can have a lot more fun and more females in the sport." On the other side of the course, the drone combat cage whirred with activity, as Marque Cornblatt, the CEO and Co-Founder of the Aerial Sports League, locked propellers with opponents until one or both of the drones fell to the ground. Cornblatt is confident that drone racing will continue to attract new fans and more diverse participants, and he thinks that today's drone pilots could be tomorrow's newest million-dollar sports stars. "This whole thing has only existed for about a year and a half in the public consciousness, and there's already so much enthusiasm for it," Cornblatt said. "Five or ten years from now, there's no reason not to assume that we'll be as big as the NFL, as big as NASCAR."